I grew up with Carol Janeway’s animal-themed tiles in my parents’ home, but only since my parents’ death at the turn of this century did I start researching Janeway’s career. My family’s amusing tiles were leftovers from my father’s career of the post-war 1940s when he crafted Janeway-designed hardwood frames for her tiles for Frederik Lunning, manager of Georg Jensen Inc, New York’s prestigious gift store at 667 Fifth Avenue. I was to learn that Carol Janeway (1913-1989) was a beautiful, lively, educated woman who lived among journalists and artists in London and Moscow in the 1930s. Returning to her native Manhattan in 1939 and finding a mentor in her artist-lover Ossip Zadkine, she re-invented herself as a successful tile designer and ceramist. Her tiles and other ceramics were commissioned chiefly by Georg Jensen Inc. and merchandized with heavy national advertising in the 1942-1949 period. She and a handful of assistants filled orders mainly from high-end gift stores and private clients, often celebrities. Her business was not based on storefront sales. Her underglaze decoration techniques for industrial tile blanks are described in her 1951 book, Ceramics and Potterymaking for Everyone (Tudor Press). Cooper Hewitt’s Housefly tile is a bit of a rarity on many levels and one of my favourites. Its sober design and execution lies outside Janeway’s usual repertory of fantastical entertaining creatures often rendered in brushy strokes: it is a meditation on an insect. While tiny illusionistic flies abound in her work, this design does not appear in Janeway’s repertory, usually animals, known from sales catalogs, advertising, extant examples nor from workshop tracing-paper templates used in transferring her designs to tiles. The tile is assuredly by Janeway herself judging by its craftsmanship. The purchaser would likely insist on it since these are signed works. Also, it is marked “sample” on its back: assuredly the artist would display her own and best work to clients. 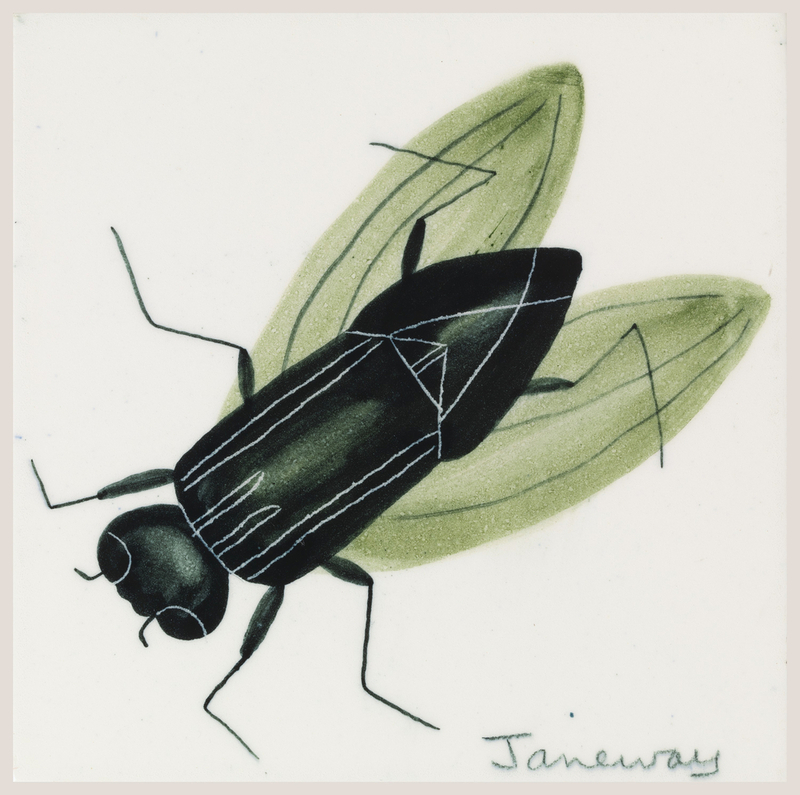 In addition, the Housefly tile is a museum rarity — one of only two Janeway ceramics held in public collections despite claims in her obituary that several prominent museums own her ceramics. A further distinction: the tile was selected by a museum-world celebrity, Calvin S. Hathaway, a Monuments Man as well as curator of the Cooper Union Museum and a tile specialist at that. He purchased this and three other tiles directly from Janeway at her studio, then located at 46 East 8th Street, just blocks from Cooper Union on Astor Place. Moreover, the Housefly tile’s existence in today’s collection is a fluke since the other three Janeway tiles are lost. They disappeared sometime in the 1960s during the chaotic demise of the Cooper Union Museum and before the collection’s subsequent salvation by the Smithsonian Institution which established the Cooper-Hewitt National Museum of Design, in 1968. Something in this tile’s design and execution attracted Calvin Hathaway. Perhaps he chose it for its quiet beauty as a contrast to the three more familiar and exuberant Janeway tiles he was purchasing. The Housefly tile was an anomaly in Janeway’s work. Did this protect it and preserve it for us? Victoria Jenssen is a retired archaeological/objects conservator and a free-lance art historian and educator. Victoria’s interest in Carol Janeway spans a website, www.caroljaneway.com and a monograph, The Art of Carol Janeway (forthcoming). The other is an ashtray in the Museum of the City of New York.There are three Janeway tile fireplace surrounds commissioned in 1947 by Lawrence Bloedel, located in Field House in Williamstown, Mass, part of The Trustees of the Reservation, and not open to the public. Russell Lynes. More Than Meets the Eye: The History and Collections of the Cooper-Hewitt Museum (Wash., D.C.: The Smithsonian Institution) 1981, p.36. Of the three tiles, one depicted a human-faced lion and two depicted fantastical birds. Accession numbers: 1947-67-1, 1947-67-2, 1947-68-2. Lovely tile and fascinating article!